No matter where life takes you, AT&T Wi-Fi is there for you the instant you need it. Whether you work from home, bounce from place to place, or have a home way out in the middle of rural America, AT&T provides wireless internet to help you stay connected and live life to the fullest. Use this Buyers Guide to make informed decisions as you purchase or upgrade your services from AT&T. You know what they say—home is where the best internet access is. And if you’re juggling multiple devices, gaming, streaming several shows at once, and working from home, then you need internet that works as hard as you. Fortunately, AT&T Internet plans have your back. Choose the best plan for you and get the AT&T Wi-Fi Gateway router included, so you can connect your devices wirelessly within your home. You’ve heard of the vague term “Wi-Fi,” but have you ever stopped to consider what it really is and how it works? 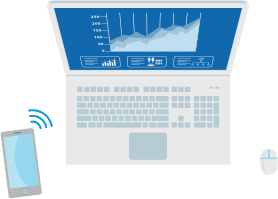 In short, Wi-Fi uses radio frequency signals instead of pesky wires and cords, so you can connect smartphones, tablets, laptops, and other wireless devices to the internet. Coupled with the AT&T Wi-Fi Gateway, you’ll have greater freedom to use wireless internet around your home, anytime you want it. Enjoy a wireless connection via the AT&T Wi-Fi Gateway, a Wi-Fi router included with AT&T Internet plans. The Wi-Fi Gateway lets you wirelessly connect your devices so you can stream your favorite shows, chat, or game around your home. Joined with an AT&T Internet plan with over 99% reliability and no-hassle pricing, what more could you want? *Claim based on U-verse High Speed Internet service. Don’t set up your router in the corner of the room. Rather, place your router in a central location, up high, and within view in the room where you most use the internet. Avoid placing your router near brick walls or concrete. Signals can only travel so far, and concrete and brick absorb your router’s Wi-Fi signals and weaken their strength. Keep your router away from the kitchen. Kitchens are full of metal objects and appliances that scatter and deflect your router’s signal. Strategically position your router’s antenna. Place the Gateway vertically if you want to spread your Wi-Fi signal horizontally. 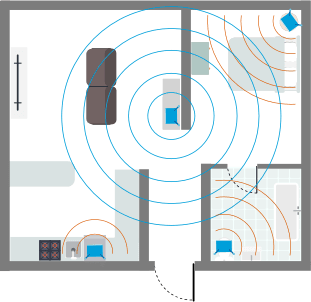 If you want the Wi-Fi to spread vertically between floors, place the Gateway horizontally. 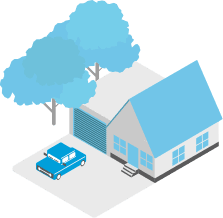 Our powerful gateways provide excellent coverage, but larger homes may require additional coverage. Be sure to ask your technician about AT&T Smart Wi-Fi Extenders. Enjoy access to AT&T Wi-Fi hotspots virtually anywhere. You’re busy. Between all the business meetings, social engagements, and other commitments, the last thing you want to worry about is losing your internet connection. That’s why, with a qualified wireless data plan and Wi-Fi capable device, AT&T gives you free access to more than 30,000 Wi-Fi hotspots nationwide. Wondering what all the hype about hotspots is about? It’s simple. 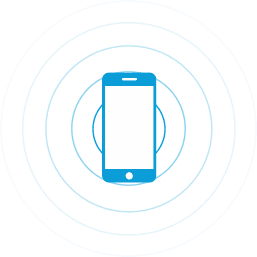 Hotspots are locations where you can connect mobile devices to the internet, and AT&T has them all across the nation. That means you can take your Wi-Fi with you without blasting through your data, and stay connected everywhere from the airport to your favorite coffee shop. AT&T Wi-Fi Basic allows AT&T Internet and AT&T wireless customers with qualifying data plans to access thousands of free AT&T Wi-Fi hotspots across the nation. Simply use your Wi-Fi enabled device to connect to the Network ID “attwifi,” and surf guilt free without using up your data. If you are not an AT&T subscriber but wish to connect to an AT&T Wi-Fi hotspot, AT&T Wi-Fi On the Spot gives you instant access to high-speed internet. Fees and session times vary, depending on the Wi-Fi hotspot location. Planning a trip abroad but still want a Wi-Fi connection? AT&T has the best global coverage of any U.S. provider to keep you connected* during your travels. Access international Wi-Fi hotspots to post to social media, send emails, browse local restaurants, and get directions all around the world. *Coverage based on offering discounted voice and data roaming, LTE roaming, and world-capable smartphones and tablets in more countries than any other U.S. carrier. International service required. Coverage not available in all areas. Coverage may vary per country and be limited/restricted in some countries. If you want to turn your Wi-Fi capable devices into AT&T hotspots without worrying about using all your data, then an Unlimited &More Premium Wireless Plan is for you. Not only will you get unlimited data, talk, and text, you’ll also get 10GB of mobile hotspot data per line*. Connect multiple devices, download music and photos, stay connected on social media, stream videos, and keep up with work—all while on the go. *After 15GB, hotspot speed slowed to max of 128 Kbps. 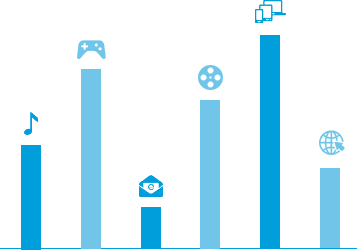 If you’re an AT&T customer and you like to download, stream, and game from multiple devices, you’re probably concerned about data overages. Don’t worry. The 10GB of mobile hotspot use per line* you’ll get with AT&T Unlimited &More Premium is the perfect solution. If you’re not an AT&T customer but want to check e-mail and post on social media, AT&T Wi-Fi on the Spot will give you data access for a small fee. A New Internet Option for Rural America. AT&T Fixed Wireless Internet provides high-speed internet to qualified homes and small businesses within eligible rural communities. With download speeds of at least 10Mbps, you’ll be able to download, surf, stream, and game without a hitch. What is AT&T Fixed Internet? AT&T will connect you to high-speed internet in two easy steps. First, by installing an outdoor antenna that connects to the nearest cell tower for a strong and reliable signal. Second, by providing an indoor Wi-Fi Gateway router so you can connect to Wi-Fi on all of your smartphones, laptops, tablets, and other devices. Once you’re all set up, enjoy a monthly data allowance of 170GB for internet usage, with additional data available to purchase if you go over. *Use of Wi-Fi at home will count towards your Internet service data plan. To see if AT&T Fixed Wireless Internet is available for your household or business, call (866) 725-1253 and Customer Care will be happy to assist you. Get the internet speeds you need with AT&T Fixed Wireless Internet. 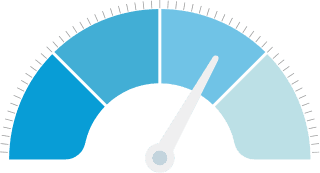 Whether you’re running a small business or downloading and streaming at home, AT&T provides download speeds of at least 10Mbps, upload speeds of at least 1Mbps, and includes 170GB of data allowance per month. You can also use these tips to keep your internet running faster by staying close to your gateway, connecting with an Ethernet cable, and using fewer devices at a time. 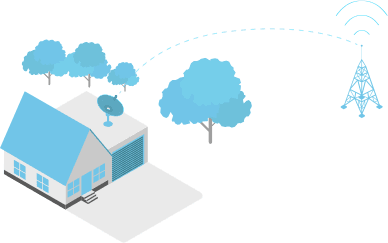 Fixed Wireless Internet is a high-speed Internet access svc providing download speeds of at least 10Mbps. Available in select rural areas in the U.S. only. Fixed Wireless Internet Plan includes 170GB data bucket per month. Requires installation of AT&T outdoor antennae and indoor Residential Gateway. Up to $99 installation fee applies. Overage Charges: $10 per 50GB of additional data up to a maximum of $200 per mo. All data allowances, incl. overages, must be used in billing period in which allowance is provided. If service is canceled, must return Residential Gateway to AT&T w/in 21 days or pay $150 Equipment Non-Return fee. Equipment Non-Return fee will be refunded if Residential Gateway is returned w/in 90 days of cancellation.